2.1 How and why has climate changed in the past? In this section of the course you will need to explore the earths previous climates alongside how and why they changed. The graph above is one way information may be presented to you in an exam as a data response question. You would need to describe the pattern and say what change has occurred over time. Use the starter from lesson one to help you structure this response. This map is taken from one of the edexcel past papers (June 2010) and students were asked to describe the changes in melt pattern between 1992 and 2002. 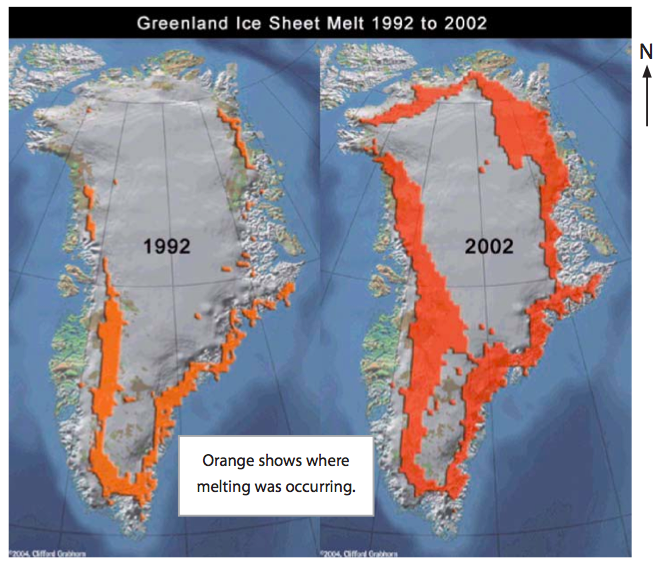 This was for two marks and you should state that melting occurs over a larger area and that there is significant melting in the North of Greenland in 2002 compared to 1992. How do we know about past climates? We can see how climate has changed over the past century from looking at our weather data which becomes more and more accurate up to the present day. 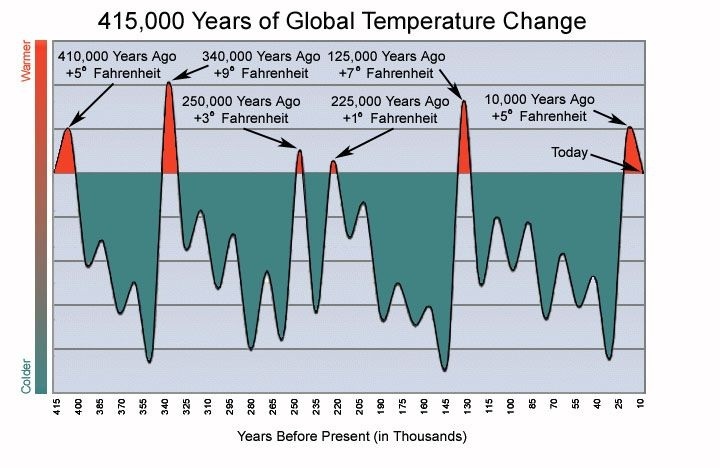 But we cant check the Met Office weather report for 50,000 years ago so paleo-climatologists have devised ways to investigate past climates as shown briefly in the graphs on the right. Visit the website the graph is from to find out more. Here are some of the past exam questions which may relate to this section of the course. Can you answer them? 1 mark awarded for a simple description. Additional mark(s) awarded for extending statements. E.g. Sunspots give off huge amounts of radiation (1 mark). Therefore, more sunspots leads to higher temperatures on Earth (1 mark). E.g. The earth’s orbit changes from circular to elliptical (1 mark). Scientists have noticed that circular orbits tend to result in lower temperatures (1 mark). Orbital Changes – (a) Changes from a circular to an oval orbit can affect the amount of sunlight the earth receives. It takes 100,000 years for the Earth’s orbit to change from being more circular to an ellipse and back again. These changes are called Milankovitch Cycles. (b) The Earth wobbles on its axis leading to changes in its tilt. When the Earth is more upright, it receives a greater amount of energy from the sun and experiences higher temperatures. Solar output is not constant. Cycles of increased activity have been detected and linked to periods of higher temperatures on Earth. The most well know phenomenon is sunspot activity. These are explosions of intense heat on the sun’s surface. For full marks, response MUST refer to BOTH solar output and orbital changes.